Sweeten your morning coffee with a vanilla sugar spoon; ready to drop into your coffee and enjoy! Love your coffee but love it a bit sweeter? 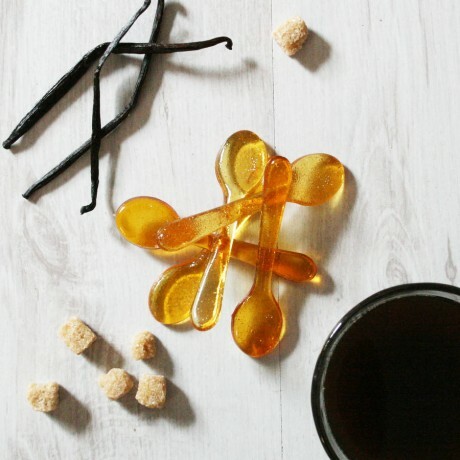 Our flavoured sugar spoons are perfect to give your morning (or any time of the day) coffee a bit of a kick! Included in the pack are five vanilla flavoured sugar spoons. Simply place the spoon in your coffee mug, wait for it to melt, and then give it a little stir to make sure it's all mixed together. Then sit back, relax and enjoy! We have several flavours of sugar spoons available; almond, salted caramel, cinnamon and gingerbread as well as a mixed pack for those who can't decide their favourites! All of our spoons have shelf life of 3-4 weeks. If you would like your spoons to be delivered at a later date than the estimated delivery date, please let us know. Please note that once the spoons have been opened from their packaging, any humidity will cause them to become sticky, so they should be immediately. Each spoon is approximately 10cm long. Novel idea looking forward to next month's surprise coffee. Novel idea looking forward to next month's surprise coffee. Excellent coffee so far and nice packaging and fits through the letter box with ease. If you are a coffee lover, then look no further! If you are a coffee lover, then look no further! Seriously, ditch wherever you used to get your supply and try out PerkUlatte. I promise you won't regret it! Had coffee from here twice now and loved it both times. Had coffee from here twice now and loved it both times. Such lovely passionate people who go above and beyond for their customers!! Artisan freshly roasted coffee blends ethically sourced from all around the world.